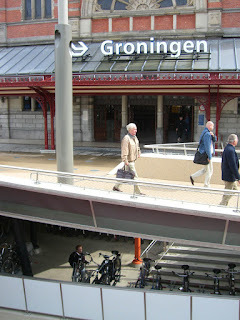 Our last hours in the Netherlands included the remarkable Groningen railway station. 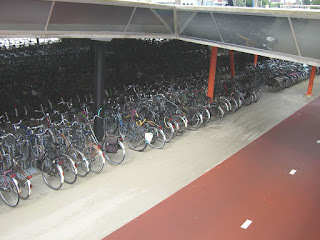 Underneath a large, open forecourtthat is devoid of traffic, resides a massive bicycle parking area, with what seemed like tens of thousands of bikes parked up. Groningen, with a population of 185,000 is about twice the size of Darlington, roughly as big as Sunderland. And this is the kind of picture that can be imagined if we had a cycling-friendly culture in the north east of England. We put our bikes on the train in Groningen, and again space is tight. It’s the rush hour on a small local train to the border town of Nieuweschans. From here, it’s a short ride to the border, but remarkably the cycle route takes us into Germany without a hint of a border crossing. Only the change in road signs and bus stops give away the change of country – we actually crossed the border on a small path that runs alongside a single-track railway line. Trains in Germany are quite different – an entire carriage at the rear of the train is given over to cyclists. The seats are lined up along the side walls, and can be up or down depending on the number of bikes. In both cases, though, we need to pay for the bikes, (daily tickets cost 6 euros in the Netherlands, 4.50 in Germany) whatever the journey. So compared to the UK pluses and minuses – we don’t pay for bikes on trains in the UK, but there is little space, and we must book in advance. In the Netherlands there is still little space, though it is at least a walk on service. In Germany, taking the bike is a lot easier, though again requires payment. So we arrive at our destination, Bremen. A few days to cycle around and gain some further impressions before the return home. After the overnight in Sneek, a wet morning’s cycling to the town of Drachten, comparable in size with Bishop Auckland, and with a Shared Space project on its inner ring road. Ten miles out from Drachten, the road – and cycle path – are closed for road works. What do we get instead? This specially constructed, temporary diversion for cyclists. This was in a small village, and it even had a nice lady at the end of it to stop traffic so that we could cross a busy road. The Shared Space concept is one that is gaining increasing support across Europe. In Drachten, the project is based on the removal of traffic lights on the busy inner ring road, and their replacement with roundabouts, and junctions like the one in this video. A bit like a zebra crossing for cyclists and pedestrians, but without the beacons! We used the crossings ourselves without a hitch, but what we noticed was that a routine was established by cyclists whereby they signalled their intention to cross with a wave of the appropriate arm, and local car drivers were waiting for the signal. In other words, local customs had developed to deal with uncertainty. The one car that failed to stop was a Polish-registered vehicle. The cyclist in question, however, was alert to the possibility and probably stopped in time when he registered that the Polish driver was dreaming rather than looking. This, we conclude, is the hub of the problem. Like Poles, most British car drivers also currently dream in these situations, safe in the assumption that they have absolute right of way. How can we change such behaviour to something more appropriate to urban driving? After so many years of motor dominance in our urban spaces, we are still trying to develop cycle routes in towns like Darlington on the assumption that the motorist should not be disturbed. Yet in contradiction, there is now said to be a hierarchy of traffic modes that puts the disabled, pedestrians and cyclists above motorists in terms of priority. This theoretical commitment now needs practical application to tackle the major barrier to urban sustainable transport development – British car driver behaviour. Rather than run away from the issue, we badly need politicians, local and national, who will show leadership, and start the long haul towards more considerate – and aware – urban driving. You sometimes forget when visiting a country like the Netherlands that it is made up of towns, cities, regions, each with their own unique identities. Crossing the 30 kilometre dyke on the Ijsselmeer reminded us of this fact. South of the dyke is Holland proper, not to be confused with the rest of the Netherlands (cf with use of “England” for “Great Britain”). North of the dyke is Friesland, a largely rural area famous for its cows. What immediately struck us as cyclists was the change in traffic treatment. Where previously we were given clear priority of crossing motor traffic – at side turnings, for example – in Friesland the approach is more tentative. Crossings like the one in the picture ask cyclists to give way to car traffic – and car drivers take the hint by driving faster, and with less awareness of what is going on around them in much the same way as Brits. The first major town we passed through after the dyke, Bolsward, proved to be typical of the region. Here, the town centre has a 30kph (20mph) speed limit, and little or no separate cycle paths. With cycling as popular here as in the rest of the Netherlands, the streets are loaded with brave cyclists and rather aggressive motorists – though thankfully far fewer than in Darlo. 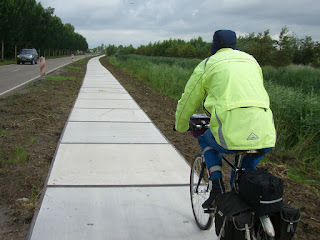 The layout of Friesland roads became apparent as we continued on to Sneek. Small country roads typically have no central line, but instead are narrowed either side with non-mandatory cycle paths, to both warn motorists that cyclists may be round the next corner, and to give them less of a feeling of the open road. Here is one example. Is this a chicken and egg problem? Does good behaviour follow clear traffic measures that give cyclists priority, or are such measures not possible where motorists are typically possessive about their road space? Perhaps the clue lies in the politics of the different regions, though little can be gleaned from the electoral arithmetic of the 2006 Dutch general election. But it does make sense, that if strong political leadership is forthcoming, anti-social driving behaviour can be challenged. And what is clear from this experience is that national patterns of behaviour can and do vary. Darlington pundits take note – stop hiding behind the “we are British, we can’t do it” excuse for inaction. Within 300 metres of getting off the ferry in Ijmuiden, we are confronted with a magic roundabout. A cycle ring towards the outer rim gives cyclists priority over vehicle traffic joining and leaving the roundabout. We know this phenomenon from previous visits to Bremen, where we have filmed a roundabout that is designed for motorists to give way to cyclists on entering or leaving. (Have a look at the Things to Come video on our 2007 Cycling Symposium site for an idea of what this means). This bikezone article gives an overview of the problems with British roundabouts from a cyclists’ point of view. Accident rates at roundabouts are a concern in most industrialised countries. It just seems that some (including the UK) can’t imagine a solution that gives such priority to non-motorised traffic. Yet studies consistently suggest that driver awareness and attention is the key to reducing accidents. Even at these cycle ring roundabouts, cyclists are watching out for sleepy car drivers. A clear run through a roundabout for a car driver reduces their propensity to pay close attention to details like cyclists. We team up with Martin (above), a cyclist from North Shields who is touring Holland for a couple of weeks. Martin has Dutch parents, but sounds Geordie through and through after being brought up on Tyneside. 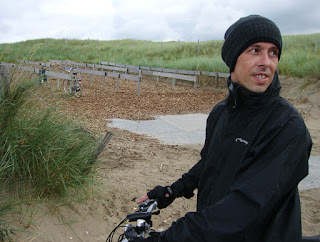 He struggles to enjoy cycling in North Shields, but loves it here in Holland. Martin’s choice of cycling on Tyneside is partly economic – he is not burdened by the spiralling costs of car ownership, and has adjusted his lifestyle accordingly. Then we cross the nearby river on a ferry that separates cars from cyclists/pedestrians, the former paying for the crossing, the latter not. So pricing policy favours sustainable transport there. 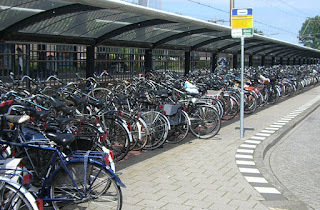 When we come across this small railway station in Castricum, we realise the depth of cycling culture in this part of the world – hundreds of bikes used to commute to a station the size of Thornaby. We say our goodbyes to Martin, who is heading up to the islands. A short train trip from Castricum to Anna Paulowna near the dyke to the north is perhaps less inspiring, and explains why most bikes are left behind. Whilst it is possible to walk on a train with your bike without pre-booking, it costs six euros for a bike “day ticket”, however short the journey. And there is little space to store bikes in the designated areas – maybe 2 or 3 bikes at a time in two or three spaces near doorways. When we tell a passenger we are heading for Germany, they mention in passing how German trains are both better and cheaper. Judgement withheld until later. After two days of rain, at last the sun comes out as we leave the train. Coupled with a decent breeze on our backs, the long ride to and over the dyke now becomes genuinely exhilarating. Tim decides to burst into song. The joys, the joys.